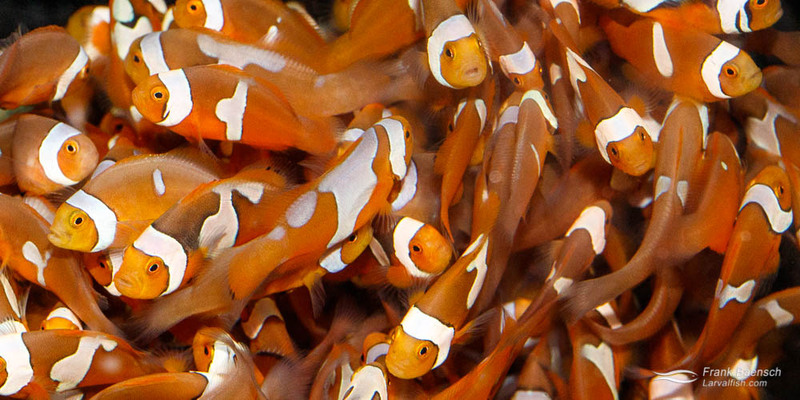 Clownfishes (Amphiprion sp.) are popular additions to any marine aquarium and the most commonly farmed marine ornamentals in the world. If you’re interested in learning to breed marine aquarium fish, this is the group to start with. Pairs can be obtained and spawned without much difficulty and the larvae are easy to grow into juveniles on rotifers and artemia. I have raised Common clownfish (Amphiprion ocellaris), Percula clownfish (Amphiprion percula), Tomato clownfish (Amphiprion frenatus), Fiji melanopus clownfish (Amphiprion melanopus), Maroon clownfish (Premnas biaculeatus) at my hatchery. (Amphiprion frenatus), Fiji Melanopus Clownfish (Amphiprion melanopus), Maroon Clownfish (Premnas biaculeatus).